Postcards are an engaging way to ask students to share what they have learned about the curriculum. Students can also create postcards to share information about a place they have visited or an important event in their lives. They could even design and share a postcard as a thank you note or digital greeting card. Wixie makes it easy to create and share print and digital postcards. Students can use Wixie's tools to design a unique image for the front of the postcard and type a message on the back. If they are sharing digitally, they can also record a voice message. Wixie even includes several postcard templates to help them get started. Create fictionalized postcards to show what you know! Students can create postcards from other times and places to share their learning about a curriculum topic in a creative way. Studying an ancient civilization? Ask students to share what it was like to visit an important place, taking on the persona of someone visiting the site during that time. Exploring geographic locations or different habitats? Create and share a postcard that demonstrates what makes this location unique and what it is like to visit. You can find and share printed examples you have collected from family and friends, or share examples digitally. Many students hate the dreaded "what they did over summer vacation" essays they have to write when they get back to school. But this is a really great way to not only get to know your students better, it is a great way for them to share a bit about themselves as they reconnect with old friends and make new ones at the beginning of the school year. Writing a thank you card shows your gratitude for the work and effort of others. Because postcards don't have a lot of space for text, they can be less intimidating for students to use to show their appreciation. If you have been on a field trip, have students share images from the trip on the cover and a quick note on the back. If someone has visited your classroom or supported your students, have them create a relevant image for the first page and thank you note on the second. Templates available to students at their Projects view make it easy to get them creating! 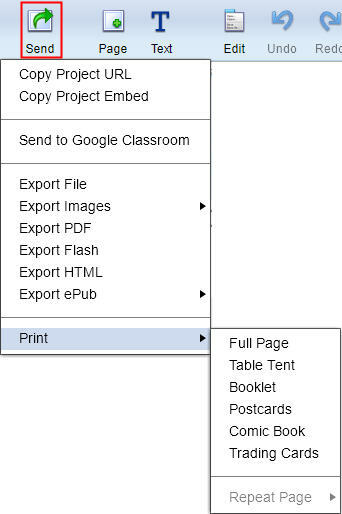 When students log in to their Wixie accounts, they simply click the Templates tab at the Project View and open one of the Postcard templates. 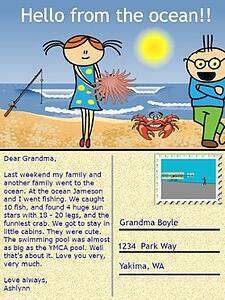 Use the Wixie tools and options to decorate the card appropriately and write a message. If you use the 2-page template, click the right arrow at the bottom of the Wixie window to move to the second page and type a message. If students have their own school email accounts, they can share their postcards over email. Have them click the Send button and choose Copy Project URL to find the online location of their postcard. Then have them open their school email program, begin a new message, paste the URL in the body of the message, and send to family and friends! Click the Send button on the toolbar, and choose one of the Print options to share a tangible copy of the postcard. If you chose the 2-page template, you can choose Table Tent to print both pages on one sheet of paper and simply fold and glue to create a two-sided postcard! Postcards are meant to be shared. No matter if you create print or digital postcards, just be sure to print and showcase or send them to someone so that students see their work is valued.